After being natural for four years, I have tried just about everything. You name it, I’ve done it and learned from my mistakes and rejoiced over my triumphs. Maintaining natural hair is not hard, but dismantling your expectations is. Here are four things I have learned about my hair care journey that I hope you can relate to, especially if you are thinking about giving up. Single strand knots (ssk), also known as fairy knots, are not going anywhere. There is not enough oiling, buttering, or tucking in the world to prevent the ends of my coils from mysteriously knotting. For the first two years of my natural hair journey I consistently wore stretched styles and updos, which all continued to result in knots on my ends. I refuse to reach for the scissors every time I encounter one because in a matter of weeks my hair would progressively be getting shorter. The only times I trim my ends are when there are too many snags while detangling, which causes breakage, and after straightening my hair. Until then, I will deal with it. As a former advocate of shower detangling, I must confess that I have seen the light. When I detangle my hair before cleansing and deep conditioning, I lose far less hair. First, I section my hair in eight sections, dampen it with water and a dollop of either the Trader Joe’s Tea Tree Tingle Conditioner or the Nature’s Gate Aloe Vera Moisturizing Conditioner, and then detangle from the ends to the roots. For years I was aware that hair is its weakest when wet, but until my recent love affair with the Ouidad Detangling Comb, the thought of detangling a wash and go at the sink was daunting. Now, I see a drastic difference in breakage when I take the time to detangle damp hair before washing. Whether it has been four days or ten days post wash, I do not worry about massive breakage when taking this approach. It’s not going anywhere. 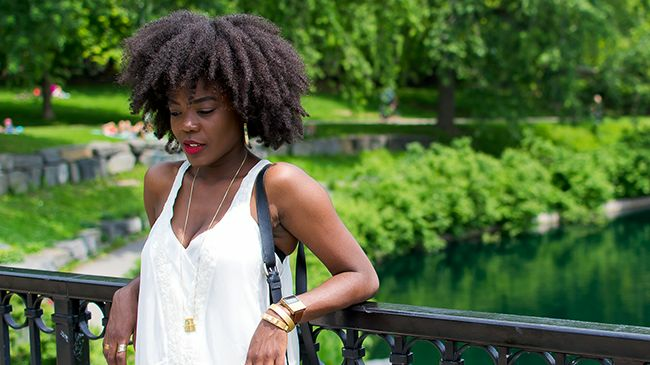 Shrinkage is inevitable with textured hair, especially in humid climates like Texas. I look back to the first 2-3 years of my hair care journey and think of all the time I wasted flat twisting my hair every night just to walk outside and feel it retract back to my scalp. I also think of how it was ingrained in me to feel self-conscious about not having hair that naturally hung to the middle of my back. Now, I am completely comfortable with the reality that my coils may always hover above my shoulder when I wear a wash and go. There is no need to stretch my hair or explain to people how long I have been natural. I stopped equating length with health a while ago. What you see is what you get. If you’re curious, who cares? I just know I refuse to waist my time wondering what other people think about my hair. I would be lying if I led you to believe that I do not have defined, 4a coils, but I would also be lying if I said I did not used to be obsessed with making sure none of them were out of place. Now I look at frizz like an effortless cloud of volume that naturally grows overnight. While a lot of women with looser textures experience flat hair over time, my hair rises throughout the week. I live for third and fourth day hair because it’s so large. As Michelle says, “Big is the new long” so whoever doesn’t like it can get used to it. I love when my hair expands and you should too. What have you come to accept about your curls?